Christmas songs in full flow and families greeting each other with tears of joy - it could only have been the arrivals hall at Dublin Airport. While spending time with family was high up on the list for those returning for the festive period, the cooking from Irish mammies was certainly a close second. 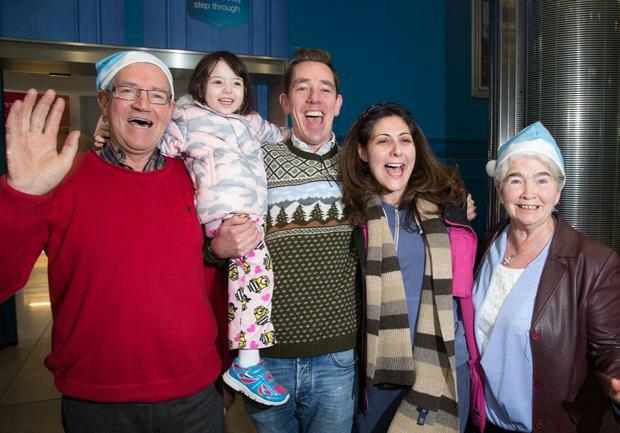 John McEvoy, originally from Laois, along with his wife Nicole and children Damon (4) and Fiona (3), was coming home for Christmas for the first time in more than a decade. "First time I've been home for Christmas in 15 years, it's the first time my sister has got to meet my kids," he said, trying to hold back the tears. His time in Long Island, New York, even meant that he did not recognise one of Ireland's biggest names. While speaking to reporters, he spotted Ryan Tubridy posing for photos with his parents and daughter but had no idea who he was. "My entire family were here to welcome us, which I'm shocked at because I didn't expect anybody to be here. I was walking out to go get a car to drive down," he said. Gareth Hennessy (26), from Dundrum, was waiting with flowers for his girlfriend Bianca Rawson (25), from Florida. Knocklyon sisters Lydia and Jasmine Redmond are reunited with sibling Victoria. The pair met in New York when Gareth was living in the States on a graduate visa. This is Bianca's first visit to Ireland. "I have no idea what to expect. I've met his father and one of his sisters, but not the mom yet, that's what this trip is for," she said. Asked how Gareth charmed her, she said: "It's the accent, definitely." 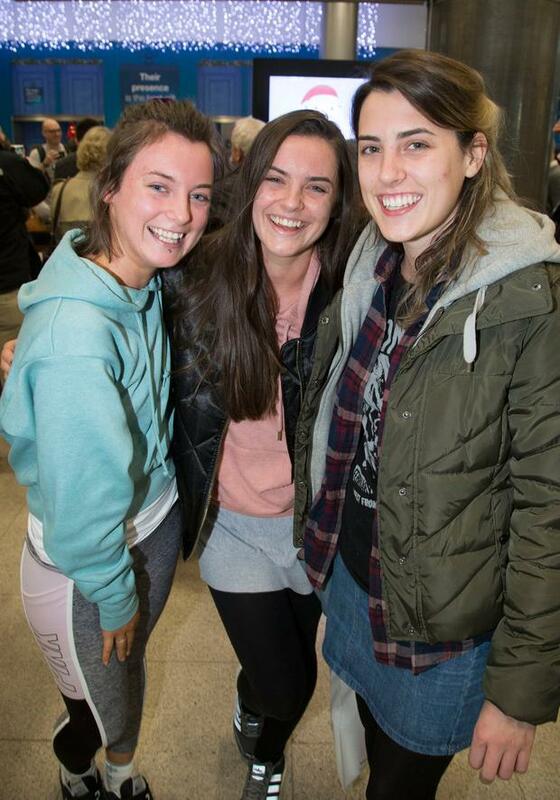 Meanwhile, for Knocklyon sisters Jasmine (25) and Lydia (21) Redmond, it was a Christmas ritual to drive to the airport and pick up their eldest sibling, Victoria (28), who's been working as an accountant in Boston for more than two years. While the sisters reunited, their parents were back home cooking the breakfast - Superquinn sausages as a special request. Asked about the excitement of returning, Victoria said she always wishes she could stay longer. "My week and a bit is very planned out. I'm just so excited. The lead-up is great, because you plan all your nights out and everyone you're going to see," she said. Mary Russell may have been the happiest mother in Terminal 2, with daughter Aislinn arriving home for the first time in two years. Aislinn is back home after living in New York. "She's been away for the last two years, she's my eldest," Mary said. "It's very special to have her home, we haven't had her for Christmas the past two years. "I'm looking forward to home-cooked dinners and sitting in front of the fire and just catching up," she added. 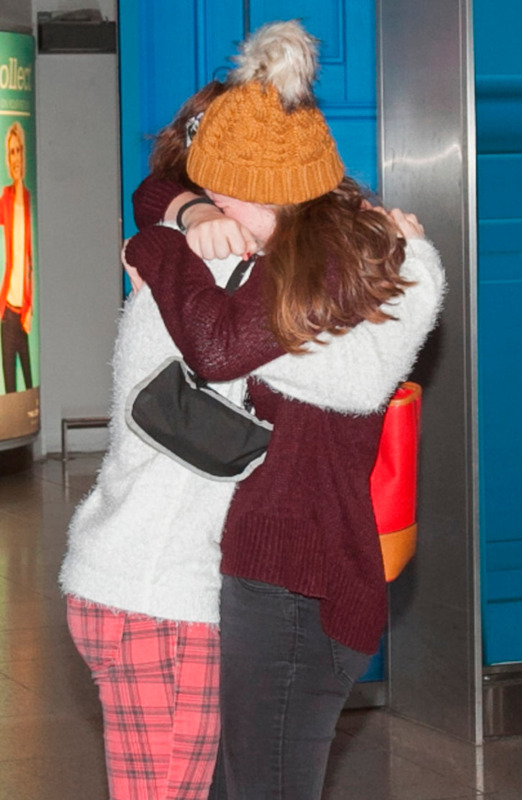 Aislinn was stunned at the scenes as she walked through the airport doors. "There's no place like home at Christwmas, it's very exciting," she said.